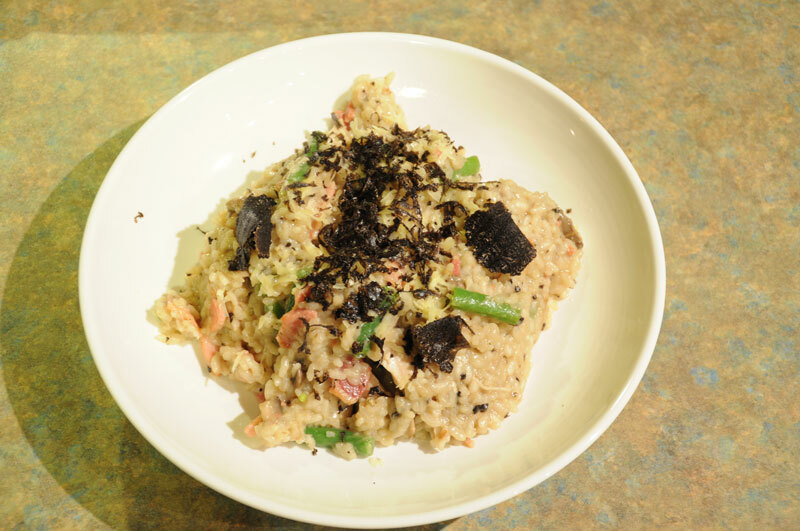 Rather than provide a step by step recipe on how to make a risotto, I'll provide what I believe to be the best method of getting truffle flavour into your favourite risotto. Just remember truffles work best with simple flavours, although it can make some surprising combinations. This method also allows you to experiment with a portion before commiting truffle to the dish. Kitchens can use this to have several menu variations. The Key to this is infusing Parmesan cheese with the truffle's aroma, preferably overnight. This approach works so well it is possible to have a superb truffle risotto experience, without actually using any truffle, although a little bit for garnish seems appropriate. Variants using more truffle are also covered below. Note on rice: Although some claim it works if a properly porous carnolli rice is used, I have yet to experience a worthwhile result from infusing rice (arborio) and I believe most of the aroma is driven off during cooking. 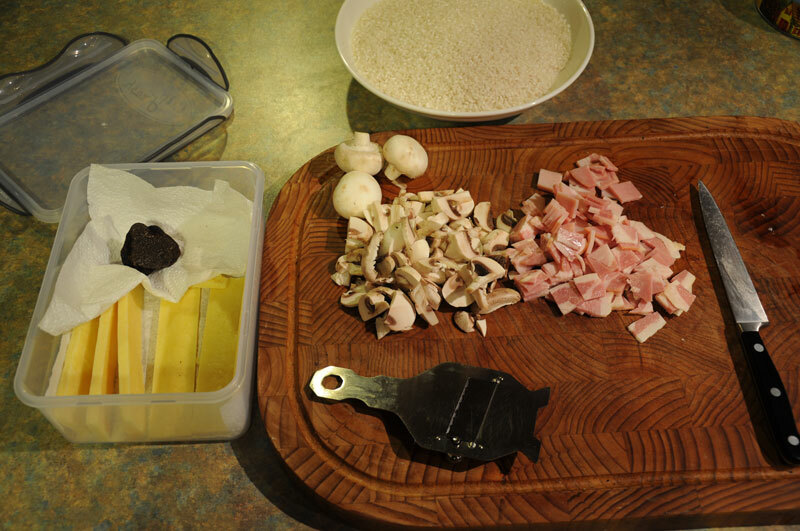 Regardless of rice type, Large amounts of rice + Truffle = "a rapidly dried out truffle"
Thickly slice the parmesan and in a sealable container, arrange the slices to maximise the exposed area. Cover with another piece of toweling and place the truffle on it. The toweling will absorb excess moisture, yet still allow the aroma to permeate the cheese. Seal the container with lid or plastic wrap and refrigerate overnight. Finally, grate the infused parmesan slices for incorporation into the risotto. Alternatively if time is short, You can grate your parmesan and truffle, mix together and allow to sit at room temperature for an hour or more while preparing other ingredients. The increased contact between the truffle and cheese amply compensates for the lack of time. once complete, I stir through most of the parmesan, reserving a little for plating. Infused parmesan will hold the flavour for a day or so before dissipating. You could infuse parmesan for a day; then use the truffle for a chicken pot one night, creating risotto stock in the process; then continue with truffle risotto the next evening, using a final piece of truffle for garnish.